One Rombe Wrong, and What Do You Get? In the brand new edition of our textbook Inland and Coastal Navigation, we use throughout what we call the Small-angle Rule. It is an approximation to the tangent of 6º that says the sides of a 6º right triangle are in the relation of 1:10. This can also be scaled up to about 18º (3:10) or on down as low as you like, ie 3º (0.5:10 = 1:20). We use it to estimate DR errors (ie steering 6º off course, you get 1 mile off your intended track for every 10 you sail); to estimate current sailings; cross track corrections; and other applications. We were proud to have made up this convenient formulation that has so many applications, and is so easy to remember. Last night, however, I got one more reminder that there is rarely anything truly original in traditional marine navigation. There have just been too many people working on it for too long. Rarely is something without precedent; it is just rediscovered or reformulated. And so is the case with our handy Small-angle Rule. He is here in a section discussing compasses and related position reckoning and wants (as we do) to offer a way to make estimates of errors. This is the time period when navigators were just learning compass use on a global scale (Columbus had no idea how his compass worked on his famous voyage), and taffrail logs to measure distance traveled through the water were first described just 15 years earlier than this book, in 1580. 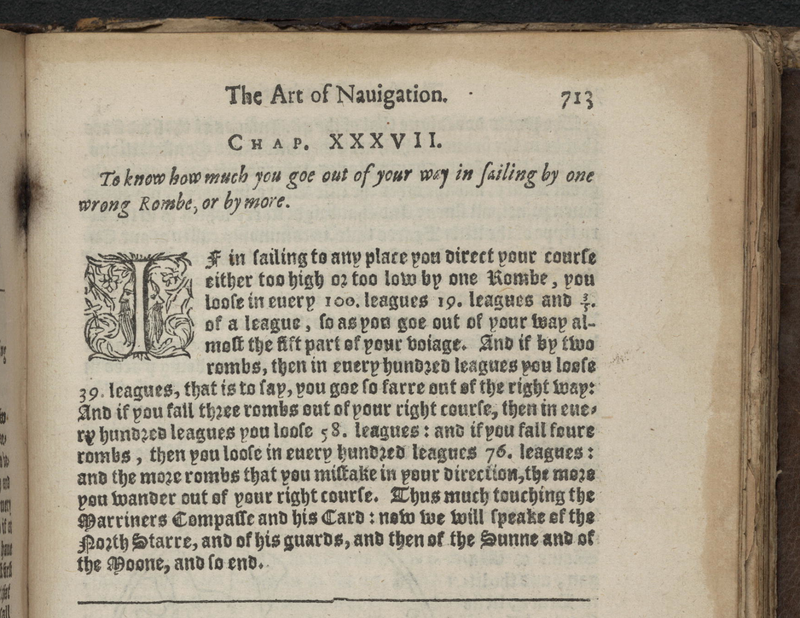 The reference to Mariner's Card, refers to early form of a Mercator chart. Below is a copy of his angle rule for DR errors. It is not directly our Small-angle Rule, but the principle is the same. That is, we skip the trig, and give specific values that can be scaled. Below this picture is the interpretation of what he means. In short, if you make good one point wrong from what you steered, you will be 19.6 miles off course for every 100 miles you log. After running 100 leagues with a course wrong by 1 Rombe, you will be off course by 19 3/5 leagues. 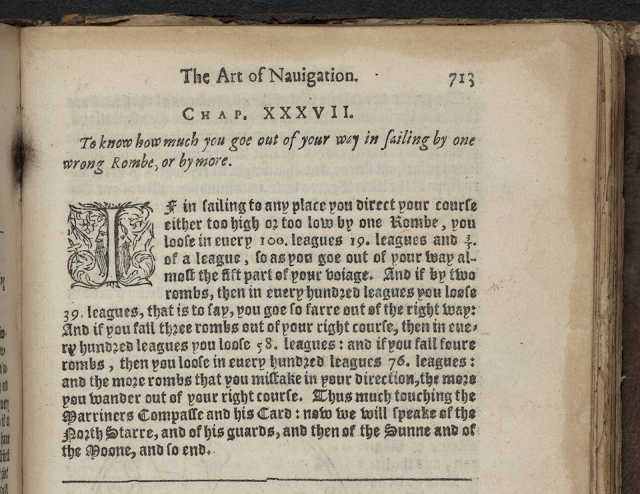 See how much easier it is to navigate now than it was 419 years ago. In updating our new text Inland and Coastal Navigation, 2nd Edition we finally removed all reference to Loran, though it might indeed be on the uptick in Europe. Here are the notes we removed, which we archive here. In this section we review other electronic aids that are either new or remain options to small-craft navigation. The technologies are not so far reaching as GPS, but nevertheless impressive in the convenience and precision they offer. Before covering new developments, we briefly review Loran, an electronic navigation system we thought was completely replaced by GPS, but there is now a renewed interest in it, especially in Europe. Keep an eye out for eLoran (e for enhanced). The oldest of all electronic aids is radio direction finding (RDF), which is covered in Chapter 11 in the High Seas Navigation section. Although this is in an entirely different class of electronic navigation, it will long remain a valuable method to know about since it can be applied with an inexpensive pocket radio using commercial AM radio broadcasts. New high-tech developments in communications are covered in Section 12.16 on Marine Radios. Loran was definitely on the way out as GPS emerged, but with increased concerns about its vulnerability, Loran is getting another look by some. It is worth a few notes here for general knowledge. GPS is still cheaper, more accurate, and easier to use, so if you do not have interest in this historical (or maybe future) aspect of navigation, you can safely skip this short section. Loran is a land-based navigation system operated by the Coast Guard. It has been in operation (with several upgrades) since World War II. It was intended solely for coastal waters, but it has been used extensively and successfully on inland waters for the past decade and was crucial to the fishing industry until GPS came along. The name derives from long-range navigation, which in some senses is an outdated acronym these days. The system works by determining lines of position from the observed arrival times of radio signals broadcast simultaneously from two stations several hundred miles apart. The lines of position are hyperbolic curves that trace out across the chart the path of all points with the same arrival-time difference between the two signals. The intersection of two such curves (from one master station coordinated with two slave stations) produces the fix. Programming within the individual Loran units then converts this information to latitude and longitude. The precision of this last step varied among the models and manufacturers and from region to region for the same unit. Regions are covered by separate groups of four or five stations each. The West Coast from Alaska to California, for example, is covered by three such groups. Positions can be determined up to 1,000 miles from the stations, but the stations themselves are often hundreds of miles inland. Although Loran measures and computes the same things as GPS (position, COG, SOG, XTE, WCV) and uses waypoints in the same manner, there are still very important differences, and these differences are still only slowly being appreciated by new users of electronic navigation. If you know how to use GPS, as outlined above, you automatically know how to use the functions of Loran—although historically the statement should be reversed; all the convenient user interface design applied to GPS was developed with Loran. But though the outputs are the same, the accuracy of the data and dependability of its operation are different. Loran has, indeed, a high reproducible accuracy (60 to 100 feet), but it has significantly less intrinsic accuracy. That is, if you store a present position as a waypoint and then travel away from it, the unit will guide you back to that precise point very accurately. But if you compared the latitude and longitude of that location read from the Loran with that read from a large-scale chart, you would find the instrument might be off as much as a couple tenths of a mile. This places limits on its use in confined waters and also on the accuracy and immediacy of its derived data, such as COG and SOG. There are ways around the intrinsic accuracy problem for position navigation, either by relying on repeated routes that have been directly stored when at the site of each waypoint, or by entering fudge factors to offset the errors for specific locations. But there is no way around its influence on COG and SOG, which, again, is the primary information required for careful navigation. It takes a Loran unit a minute or two and sometimes longer to figure your COG and SOG, because it must average over a longer period to compensate for its lower position accuracy. If you were sailing at a constant rate, in constant current and constant wind for five minutes, then the COG and SOG it shows will be as accurate as that of GPS. But the moment you turn or the current changes, you will get inaccurate readings on the Loran until things have stabilized for a few minutes. In contrast, GPS takes just a few seconds to detect new motion, although even GPS results (without differential corrections) should also be averaged over at least thirty seconds for reliable speed and course information. Another drawback with the early Loran was its much higher vulnerability to local electromagnetic noise or static. This is not nearly the problem for small vessel use as it is for larger vessels with engines, fluorescent lights, televisions, and so forth, but it still influences operation in some areas because ambient noise levels in the environment outside of the boat depend on location and time of day. Likewise, electrical storms interfere with Loran but have little influence on GPS. There also are other factors that inhibit the use of Loran that can all be traced to the fixed geometry of the land-based transmitting stations. Many of the problems that arise from these factors can in fact be corrected for by user adjustments, but the vast majority of Loran users, on any size vessel, did not get involved in this level of its operation. GPS, on the other hand, provides what most users want—a true black box, with no required tuning or adjustments. The 2012 Federal Radionavigation Plan does not mention eLoran, but it is much in the 2013 international navigation news and in professional journals. It is definitely something to keep an eye on.